I almost forgot to show you this one! I made it a little while ago, and then it was immediately mailed off to its new home, so I didn’t really get to spend any time admiring it. It was pretty cute though! 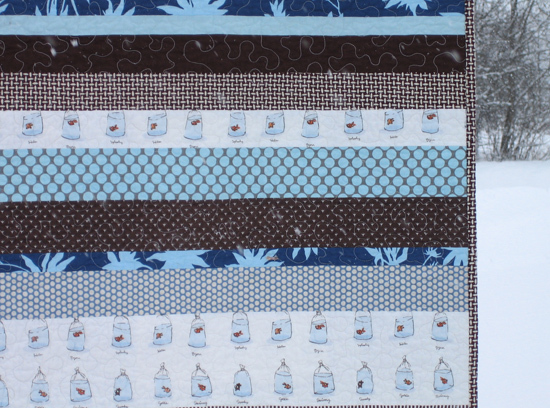 Perhaps you recall the stack of blue and brown fabrics I showed earlier? I really love those colors together – simple yet sophisticated, I think. And I’m always happy when I can come up with something appropriate for a boy. Once again, I went for nice simple stripes so I could really show off those cute Heather Ross goldfish. For the backing, I used a nice blue solid (blueberry, maybe?) and a wide stripe of some of the remaining fabrics. Goldfish on both sides – what could be better than that?! I stippled it with a cream colored thread, and bound it with the brown Katie Jump Rope basketweave print. I hope it will be well-loved in its new home! 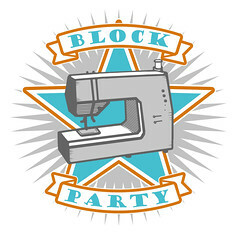 This entry was posted in [search] Strip Quilts, 2010 Finished Quilts, Finished Quilts, Posts about Quilts, Quilts and tagged baby boy, goldfish, handmade, Heather Ross, quilt, quilting, strip quilt. Bookmark the permalink. I love that the goldfish really stands out!! I was just wondering what you ended up doing with that adorable stack you had shown us! How cute, indeed! I’m sure the little boy will love this quilt up! *LOVE*. Just think, that baby boy will have a nice childhood memory of laying down to nap, snuggle, read with all his “pet” goldfish to look at. How much you want to bet he will remember all their names even when he is older? Super cute! At least you remembered to take a photo- I sent off a bunch of hand knit Christmas gifts without taking pictures this year. Whoever holds your quilts up for you is a very good sport! Love it! Great fabric combos. Oh my gosh I am in love with that! I totally know what you mean about making a decent boy quilt or anything for that matter. 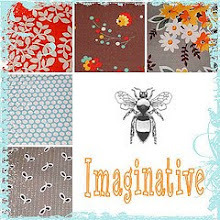 I am always so tickled when I find the perfect boy fabrics!! I have all boys in my house (even the dog is on their side) and while I wouldn’t have it any other way I am glad I have friends with girls to make all the fun bright colored dresses and blankets for! Simple and cute, a fabulous combination! Well done! And of course, luv, luv, luv the pieced back!! I like it too. I don’t want you to think I don’t notice the lovely quilt, but the snow! I’m a California girl and it’s going to be in the 70’s today. Sure I can drive to the snow and be in it in an hour but it’s such a novelty. I think it’s so pretty and such a likely reason for a fire in the fireplace. Last night I had a fire going when my husband came home because he loves it. But we also had the back door open to cool. Such a difference. Have a lovely day. This is a really great quilt. Love the color combo! So very, very cute! I’ve always loved that goldfish fabric. So cute! 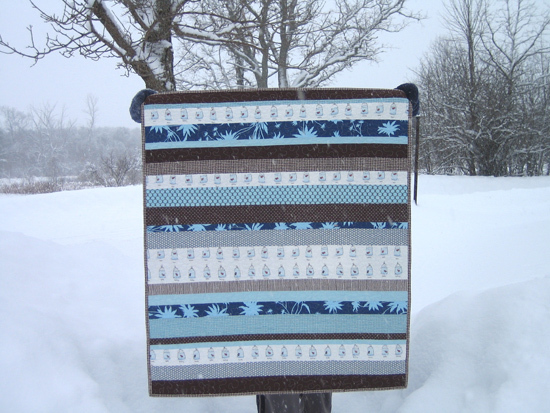 You can’t go wrong with blue and brown and with the snow it the background it looks wonderful! I love it. Great use of the goldfish. It is sophisticated, and very calming, what a lucky little boy! As the mommy to one of those sweet little boys, I say it is wonderful! Could I love that goldfish fabric any more? No, no I could not. What a great quilt. 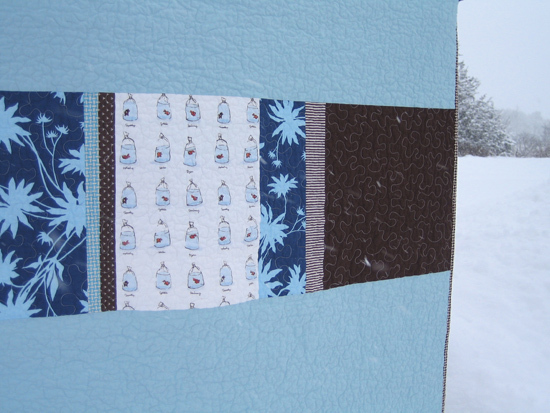 I love the quilt too – that goldfish fabric is one of my all-time favorites – you were so brave to cut into it 🙂 but all I can think about is all that snow – it must be so cold – I can’t imagine! So cute! And that goldfish fabric is divine. This is a really nice quilt for a boy, oh boy this goldfish fabric…sigh! Ashley, that quilt is SO cute. I just love the goldfish fabric and I’m glad I have some. The other fabrics you chose were perfect. And to Marty above: I’m from California too. I totally get what you mean about lighting a fire, and opening the back door. So COLD!! Beautiful blanket, I love the blues and browns. I can’t believe how quick you are! Very cute! I love the blue and brown fabrics and it’s a great use of the goldfish fabric. Absolutely love the colours and the simplicity of it. It looks great against the white snow too. Love this, and loved the other two you made that were similar too! What is the dark/light blue combination fabric? 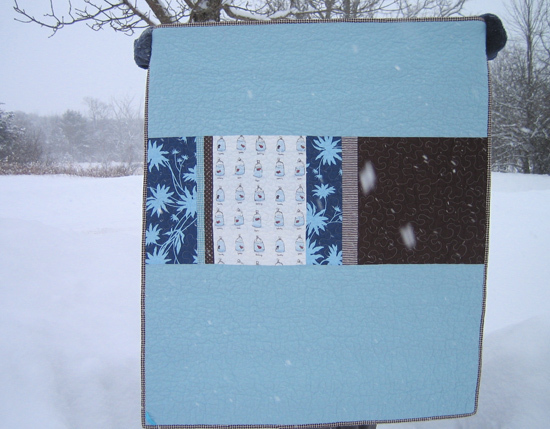 That’s gorgeous, and I love the setting for your photo – it makes the quilt look amazing! i love it!!! i am always fond of stripes!! Beautiful Ashley! I really love this!!! Ooooh, I think this is one of my favourites that you have made. It’s fun to see the fabric used that way. I love the goldfish fabric too but don’t know where I can purchase some. I think it’s out of print… help! i’m a sucker for blue and brown…pretty cute! i really love your quilt! i looked for your contact info, but i couldn’t find it (forgive me for writing this as a comment)…i am getting ready to make my first quilt and i would love to make one with stripes like this, did you use a pattern? – i am no good at coming up with random-ness and i don’t know what sizes would work good for stripes…would you be able to help me? I would really appreciate any help you could offer…i found your website a few weeks ago and i have really loved looking at all your quilts! thanks for sharing – what an inspiration!